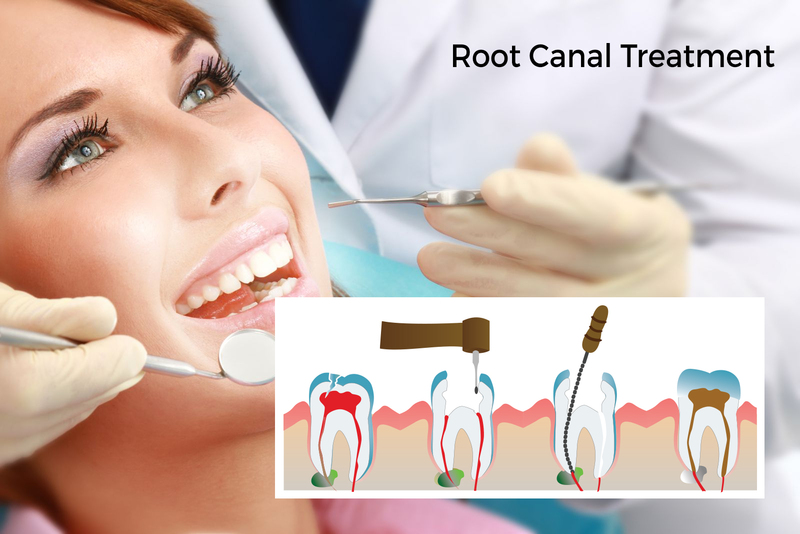 Root canal is a treatment of mending and saving a damaged teeth rather than removing it. The treatment includes removing the infected area of the tooth known as the pulp and cleaning it, next filling and sealing it. The general reasons affecting the pulp are a cracked tooth and cavity. We totally numb the tooth and nearby tissues with local anesthesia to make sure that you feel comfortable throughout the treatment. We separate the affected tooth with rubber dam to keep an infection free environment while working on the tooth. Next we access the inner part of the tooth the pulp and root canals. After we have acquired access we will clear out all of the dead tissue from the pulp and root canals and next cleanse the vacant chamber and canals with antibacterial formula. Then we will shape the walls of the mini root canals to include a filling material known as gutta-percha to fill the canals and pulp chamber. After we finish the filling we will seal the access hole and momentarily close the tooth with another filling. Subsequently we will fix a lasting crown that will provide the tooth extra protection opposed to another infection. Numerous times when patients visit to the dentist for a toothache because of there is an infection deep inside the root of the tooth. The pain can be severe and is really far bad than the root canal treatment itself. Throughout the treatment, the region surrounding the infected tooth will be numbed so you will not feel an uncomfortable. Then, you’ll feel relief because you will no longer have a painful toothache! If you allow your tooth infection go and do not look for treatment, there will be possibilities of losing that tooth in the end. The infection can expand to other teeth in your mouth. A root canal will prevent your tooth because your dentist will remove the infected tooth pulp, next fill the tooth and seal it. With the infection away, your tooth will exist. After the root canal treatment, your dentist will cap the tooth with a dental crown. This will reinstate its full function, and it will also mix in seamlessly with the other teeth in your mouth.